Somehow we managed to overcome the great Christmas blizzard and make it out of the house to see a movie on Christmas Day. It continued snowing into the 26th and I still went out with an old high school friend (thanks to Ashlea for driving in her huge truck!) to see another movie. Two movies in two days! Unheard of! 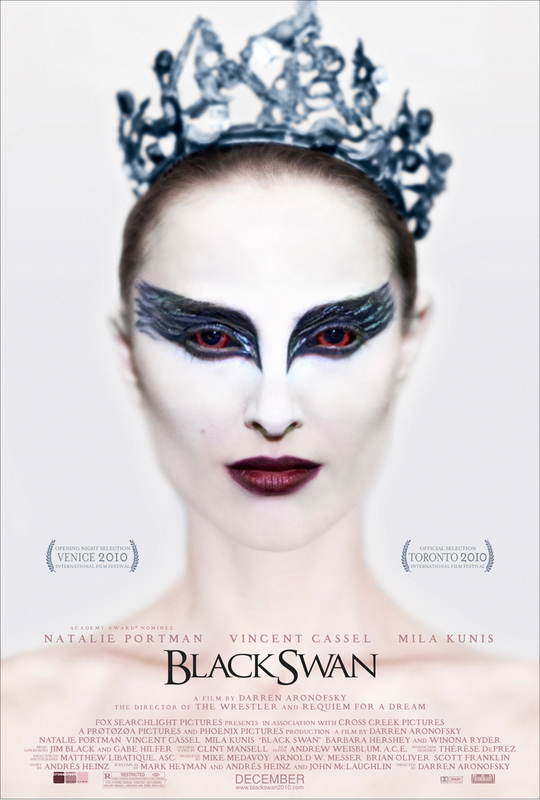 There weren't many great movies out in our local theaters this year, so my parents and I went to see the Black Swan on Christmas Day. I was worried it might be too racy for my parents. They expressed interest on their own, so I wasn't going to feel so bad if it was inappropriate. In the end I liked it. My parents did not. Was it a feel good, uplifting Christmas movie? No. But it was beautiful and well made, and I was a little shaky at the end because it was all so intense. It is definitely not a movie for the faint of heart. Natalie Portman was outstanding. Her character is mentally troubled but very outwardly controlled. She played both sides so well. It was difficult to discern reality from her delusions. She did most of the dancing herself and was excellent. In a supporting role, Mila Kunis did most of her own dancing too. I've only ever seen her on That 70's Show and the voice of Meg in Family Guy, so it was interesting to see her in a different role. The movie was weird and depressing and nerve racking but also really good. You have to be in the mood, but I would definitely recommend it! Plus, I am a sucker for a good ballet movie. Center Stage, anyone?! (From which, this guy is on my very short celebrity sightings list.) I can't wait to get back to NYC and get tickets to see a performance sometime! My friend, Ashlea, and I made plans to get together while I was home for the holidays. There isn't much to do in Huntsville, so we settled on a movie. She suggested Life as We Know It at the newly converted dollar theater (I'm starting to feel old because I remember when they built the theater several years ago. It must have traveled through its entire life cycle as a full price theater and was now outdated and demoted to carry older movies which have been out for several months. Regardless of their sustainability model, it was nice to pay just $1 as opposed to 10 or 12 in NYC).